TV4Fun wrote: Is the password ever passed as an argument to a GET query? I can imagine a case where that would cause the problem. Bad practice, but it likely happens. 720 millinewtons is a little more than the weight of a tennis ball. That's not particularly small. You should be able to get the UTC time with 'new Date().getTime();'. No need to apply any offsets. I thought we were referring to the placement of names on the map moving depending on if DST was in effect for that area, not for your area. syberspot wrote: But does it update for daylight savings time? And, does it skip daylight savings time on years that are multiples of 100 but not 400? I thought the 100 but not 400 thing was leap years, not DST? 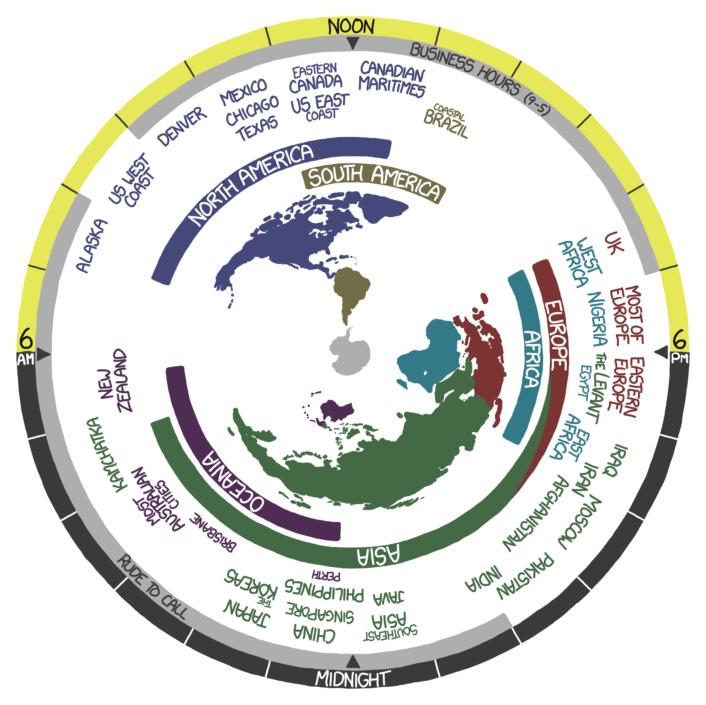 DST would be a horror, with all the different ways countries calculate when to have it. It looks like an auto-update similar to that on Time, though. And it's fixed (almost - it's just after 18:00 here in NZ, but the comic implies that it's just before). Three threads posted within 24 seconds. Wow. It seems almost 180° out, to me... It should be ~6 PM here in NZ, but apparently it's just before 6AM. Yeah, I don't exactly pay attention to horoscopes... For some reason I thought that a Sagittarius was some extinct creature. PHP needs to go up the top, too. I don't know why it needs the $variable, given that C, Java, and many other languages use similar syntax without it. King Author wrote: Neat. Though the sites I connect to can still log any information I enter into them, and even track my IP, yes? They could get that even if you went to them directly by typing in the URL. That's open to any site, unless you use a proxy or Tor on your end. Just made another new GMail (alerts from NAS), and this time it set me up with G+ right from the start; last time it didn't but was pushing it at me. Something has changed in the last few weeks. Still able to delete it, though. Hmm. I may have to try setting up a new GMail account - I've been meaning to make a spam type account for a while. Will go have a look. EDIT: Nope, It's telling me to create a G+ profile, on a brand new account. I am in NZ though, so it might act differently elsewhere. Why not just grab everything in the <tr>...</tr> element? Isn't that what you want? Then just strip the <tr> tags. http://imgs.xkcd.com/comics/improved_keyboard.png I'm always installing tons of weird experimental keyboards because it serves as a good reminder that nothing I was going to type was really worth the trouble. Personally, I'm just using the AOSP 4.2+ keyboard, with swype-like typing. EDIT: Fixed text. I remember using 3.5" floppies before I went to school... Never did anything with 5.25" or older, though. I'm only just 17. My dad's work used to have a camera that took 3.5" floppies, which we occasionally borrowed. Probably still got some of the photos. Just don't use PHP: 4 ^ 3 returns 7 (it's bitwise XOR). I think int(x) is usually truncate or round toward zero; that is 3.14 => 3, 5.6 => 5, -2.2 => -2. You get the picture. Interesting idea. Does a 20mW laser targeting any security/facial recognition cameras count as a crime? It would at least block you out, and probably damage the sensor. Plus working out who did it would be difficult. Sounds like I've got some reading to do.